Happy Spring everyone! The sun has been shining enough that my herb garden is taking off, and I like nothing more than to harvest fresh herbs to use in everything from meat rubs, to salads. Lately, my cilantro has gone a little crazy, so today I used it to make a delicious side dish for the BBQ chicken breasts we are having tonight. You are going to love it! First, you are going to need a BBQ. But, if you don’t have one, you can easily grill the corn in the oven under the broiler, so don’t give up on me yet! 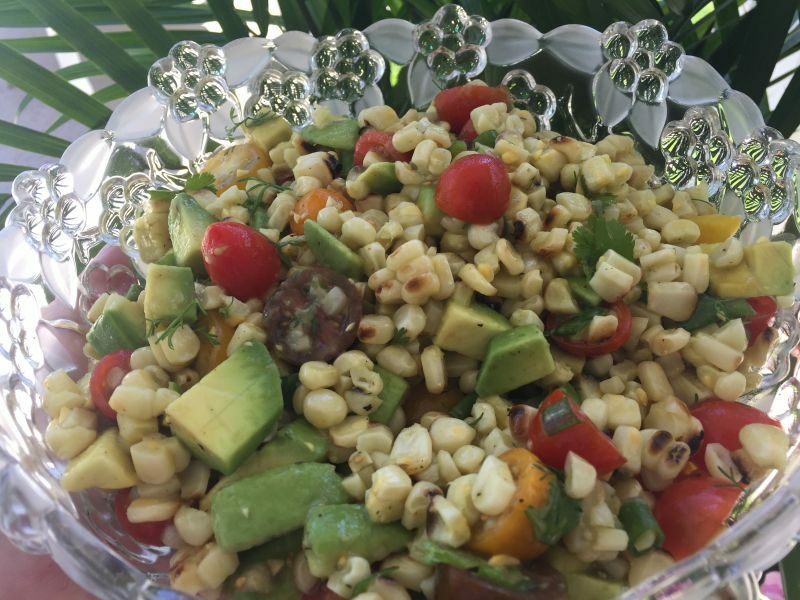 This side dish is a Grilled Corn and Heirloom Tomato dish that is to die for, and I have a hard time not digging in while I am putting it together! 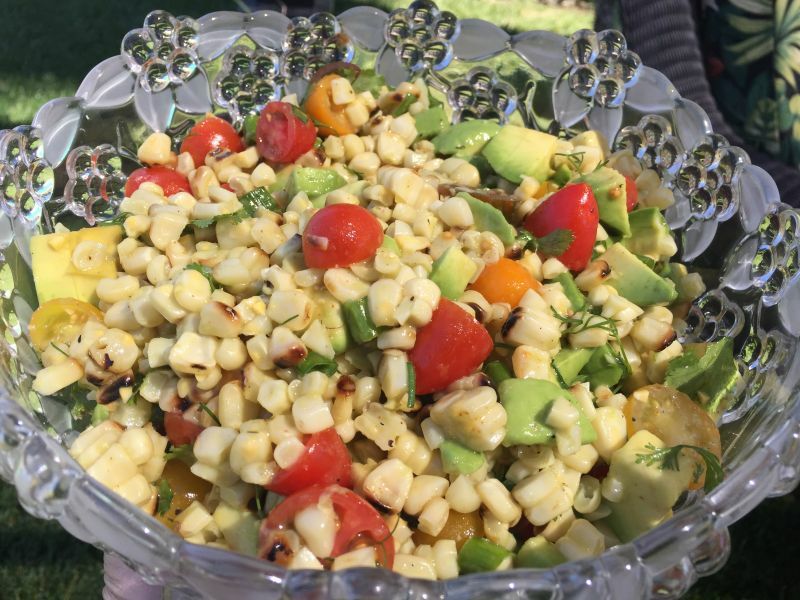 The sweet grilled flavor of the corn is so delicious with the honey and lime dressing! California Girl comments: I saw this recipe and my mouth began to water. It looks like the perfect complement to my summer menus; cool, fresh and healthy. I can’t wait to make this! I promise, once you make this it will become a regular dish all summer long! 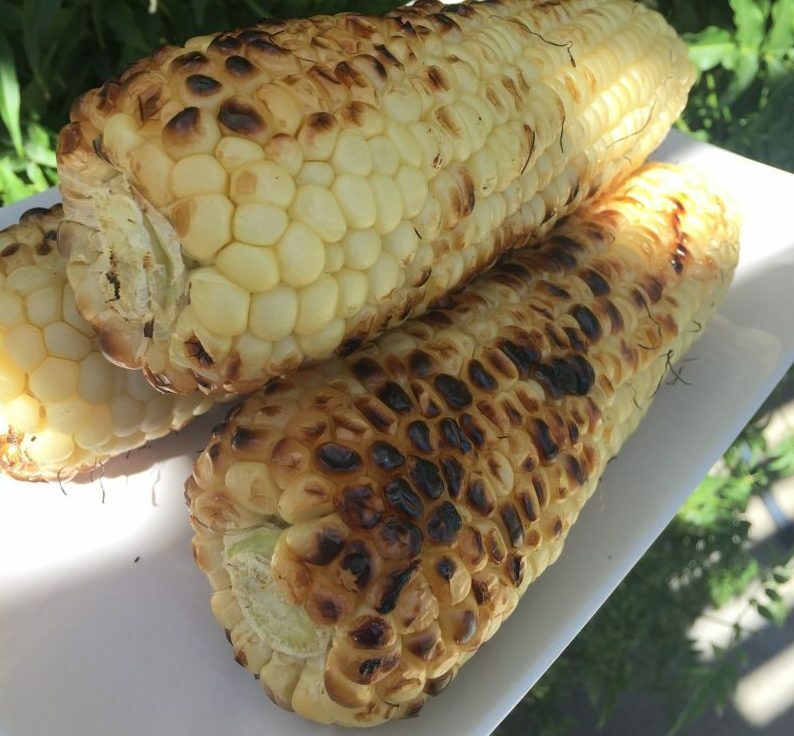 Clean the corn and place on the grill, and turning regularly so they don’t burn, grill them until the surface is scattered with golden brown corn kernels. A few charred ones are ok, so don’t fret if you blacken a few. It should take about 10-15 minutes to cook the corn over a high heat. Watch them closely. After you take them off the grill, allow them to cool long enough to handle and then slice the kernels off of the ears and place in a large mixing bowl. 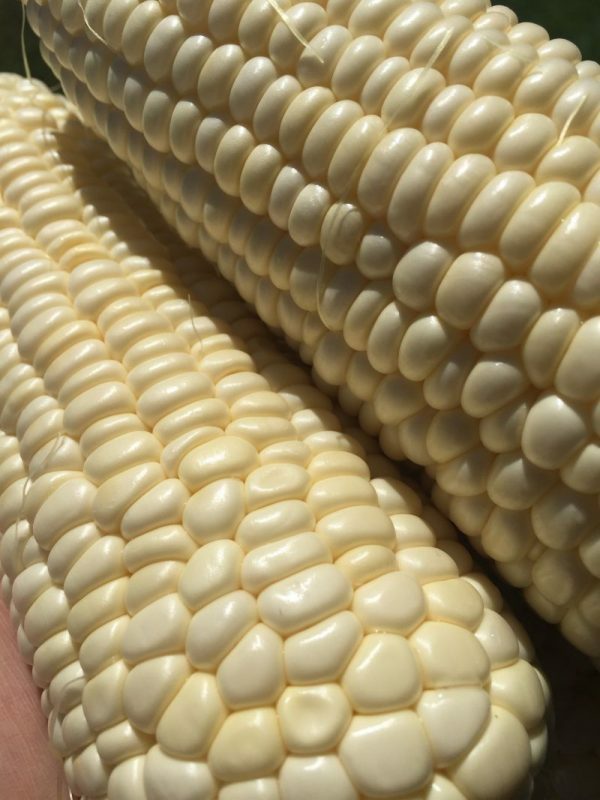 Use the knife to scrape the ears down to get all the yumminess off the ear and toss that in with the kernels too! Rinse and dry the cherry tomatoes. 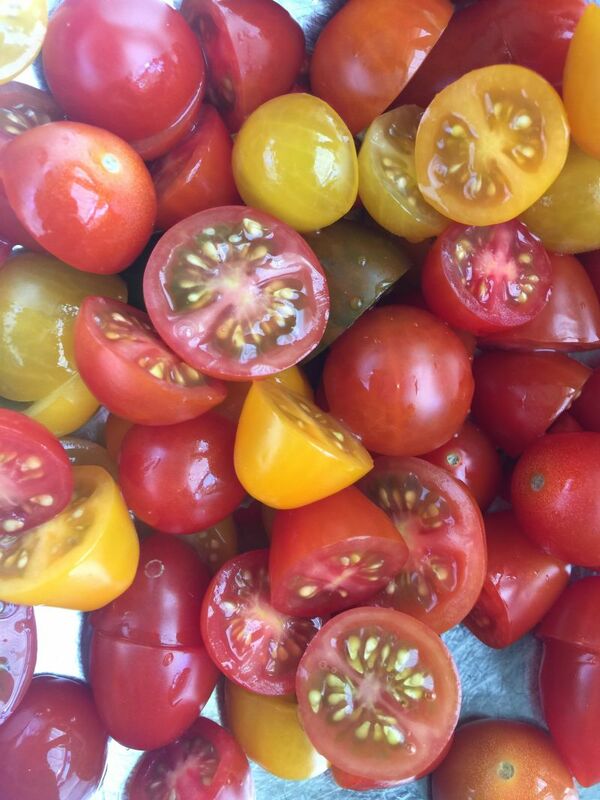 I found some beautiful heirloom cherry tomatoes at the market, and they do make the salad look so lovely…but honestly, regular cherry tomatoes will work just fine! Use what you have available! Cut the tomatoes in half, and toss them in with the grilled corn kernels. Add the sliced onions, cilantro, and the avocado. Sprinkle a dash of red pepper powder over the vegetables and then add a dash of sea salt and a dash of freshly ground pepper. Toss gently. In a small bowl, whisk together the oil, honey, and the juice of one large lime. Use a juicer so you get every last bit of juice out of the lime! Seriously, if you are going to squeeze the lime by hand, you won’t get enough juice out of it! Once mixed, pour gently over the mixture in the bowl, and toss gently with a rubber spatula so you don’t bruise the avocado. California Girl comments: I can totally picture this served warm over grilled salmon or chicken, even adding chopped jalapeno. Yummy! Ms. April always inspires me with her amazing recipes. Viola! (just practicing my French again….hee hee). While the corn is grilling, do all the prep on your other ingredients. It makes this recipe very fast to put together! 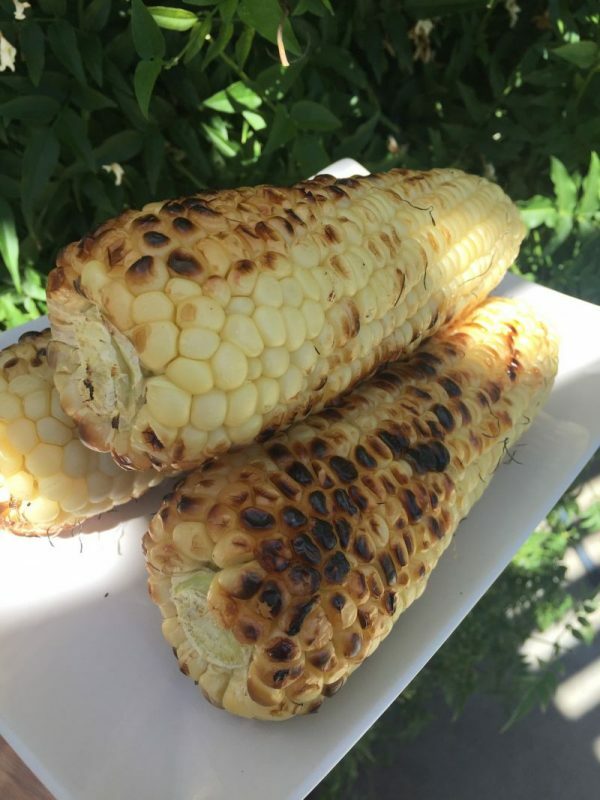 love grilled corn! And it is getting close to jersey tomato time! I love grilling romaine lettuce and making the grilled corn salad wraps.